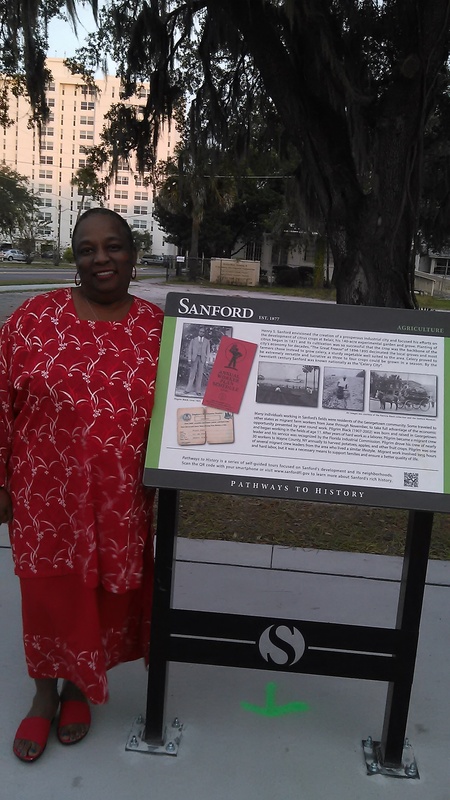 Patricia Ann Black next to the Heritage Marker #3 of the Georgetown Pathways to History Project, which was developed by the Georgetown Heritage Advisory Committee with assistance from the Sanford Museum and Sanford Historical Society. Georgetown was established by the city's founder, Henry Shelton Sanford, as a suburb for African-American residents in the 1870s. The neighborhood spans along Sanford Avenue, with its commercial district between First Street and Fifth Street and its historic district between Seventh Street and Tenth Street. Though originally much smaller, Georgetown spanned to its present boundaries from East Second Street to Celery Avenue and from Sanford Avenue to Mellonville Avenue. Georgetown thrived at its height from circa 1880 to 1940, particularly in agriculture and transportation. Black was the daughter of Pilgrim Black (1905-2002) and Lula Mae Haynes Black (1917-2007), who got married in 1937. Patricia was born August 31, 1956, and grew up at the end of East Tenth Street in Sanford, Florida. She attended Hopper Elementary through sixth grade, Lakeview Middle School for seventh grade, Sanford Junior High School for eighth grade, Crooms High School for ninth grade, and Seminole High School through twelfth grade. She also attended school in the North Rose-Wolcott district each year while in Upsstate New York. During fourth grade, integration began and parents were given the choice to have their children to attend other schools, but Patricia chose to continue attending an all-black school until she entered seventh grade in 1968 and began attending integrated schools. In June 1973, Patricia married her first husband, Clint Holt (1955-); however, the couple quickly separated due to domestic violence and divorced around 1977. Patricia gave birth to her first child, Charmion Le'Antwinetta Holt (1974- ). She also had three other children with William Bigham Jr. (1952- ), who she was married to for 33 years: William Arthur Bigham III (1982- ), Brandon Oliver Black (1990- ), and Tempestt Teonte' Black (1992- ). Patricia currently lives in the family home built by her grandmother, Maggie Benjamin Black (ca.1870-ca.1934) on East Tenth Street in Sanford. Patricia endured weekly molestation for 11 years from age six to age seventeen and was raped at age seventeen while pregnant with Charmion. At age 29, Patricia became severely addicted to smoking cocaine. After seven years, Patricia was able to overcome her addiction and has maintained her sobriety for 21 years. She has suffered severe mental and physical damage and is still recovering today. Despite her traumatic experiences and sibling rejections, Patricia has developed a devout relationship with God. While in recovery, Patricia refocused her attention on spreading her ministry of love by becoming a foster parent, serving as the Parent Representative of the Committee for Special Education (CSE), and serving on her local school board in the North Rose-Wolcott school district. Patricia also has owned her own business making incense and importing shea butter from Africa. She also became a licensed nail technician specializing in stress-relieving pedicures. As of 2009, Patricia is retired but still maintains some involvement in her business/ministry named GIFTED. Original color digital images by Charmion Le'Antwinetta Holt, November 20, 2014. Patricia Black Collection, RICHES of Central Florida. Originally created by Charmion Le'Antwinetta Holt. Copyright to this resource is held by Charmion Le'Antwinetta Holt and is provided here by RICHES of Central Florida for educational purposes only. 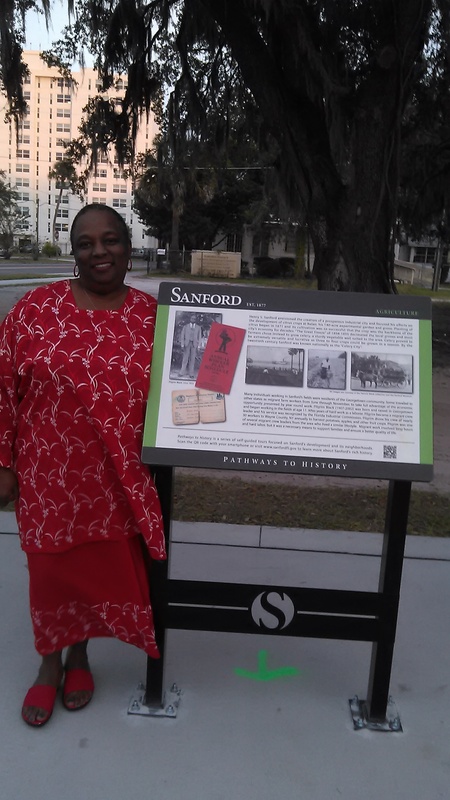 "Sanford Avenue Streetscape Completion and Unveiling of Heritage Markers." Department of Recereation, City of Sanford Government. http://www.sanfordfl.gov/index.aspx?page=20&recordid=3760. Delinski, Rachel. "City to celebrate completion of Sanford Avenue." 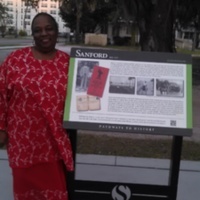 The Sanford Herald, November 17, 2014. http://mysanfordherald.com/view/full_story/26115431/article-City-to-celebrate-completion-of-Sanford-Avenue?instance=home_news_bullets. Carroquino, Carmen. "Sanford Avenue reopens after $2.9 million makeover." MyFox.Orlando.com, August 18, 2014. http://www.myfoxorlando.com/story/26308142/sanford-avenue-reopens-after-29-million-makeover. "Pathways to History - Historic Georgetown." City of Sanford. http://www.sanfordfl.gov/index.aspx?page=483. Holt, Charmion Le'Antwinetta. 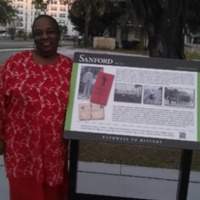 “Patricia Ann Black with the Georgetown Pathways to History Project Heritage Marker #3.” RICHES of Central Florida accessed April 20, 2019, https://richesmi.cah.ucf.edu/omeka/items/show/4759.